DC also read the script for the pilot and describes him as “nomadic.” His experiences have left him traumatized—we’ve heard that he displays symptoms of PTSD or some similar affliction—and he has taken to moving from place to place to avoid continuous Deadite attacks. He dwells in various trailer parks throughout the Midwest, toils as a stockroom trainee at a big box store, much like his days at S-Mart, and spends “his evenings chasing skirt in roadside bars.” So not a lot has changed in many regards. Campbell will serve as a producer along with Raimi, who will direct the pilot from a script he co-wrote, and reveals that they have big plans beyond just the initial ten-episode run. He says they intend to make five full seasons, that is, if everything works out. We can certainly get behind that. What we’ve heard of the plot makes Ash Vs. 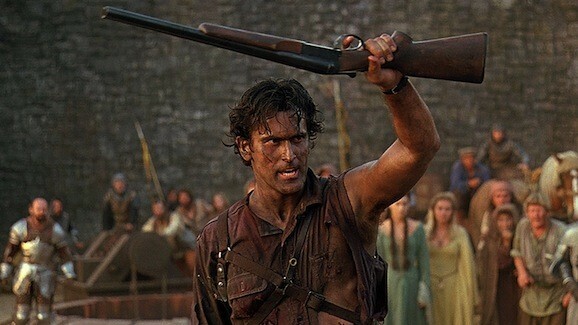 Evil Dead sound like a road trip involving Ash and two new sidekicks. We recently learned that Ray Santiago and Dana DeLorenzo have signed on to play these roles. Santiago is Pablo Simon Boliver, the idealistic son of an immigrant who believes in his big buddy even when Ash doesn’t. DeLorenzo plays Kelly Maxwell, a more reluctant member of their team, who has her own demons lurking in her past, but still bonds with the others. The latest addition to the cast is Sleepy Hollow and American Horror Story alum Jill Marie Jones. She’s slated to play Amanda Fisher, a disgraced Michigan State Trooper who, after the gory murder of her partner, goes on a quest to find Ash, who she believes is the one responsible for the death. However, as the rest of us already know, she learns that he and his pals may be the only ones who can defeat an ancient evil. That sounds pretty damn awesome to us, and we can’t wait for these episodes to finally drop later this year. In the meantime, we have to figure out how to get Starz added to our cable package. It depends on what ending you watched, the dvd is different from the vhs… they filmed two different endings.